Retirement Jobs: Learn about jobs for retirees and becoming a working senior. Once upon a time "retirement" meant dropping out of the workforce entirely to pursue leisure or rest. In fact, the dictionary defines the word "retire" as "1.) To withdraw, as for rest or seclusion, 2) To go to bed, 3) To withdraw from one's occupation, business, or office; stop working. 4) To fall back or retreat, as from battle. 5) To move back or away; recede." However, work and retirement are no longer mutually exclusive ideas. The current generation of retirees is redefining what it means to be retired – both out of necessity and choice. 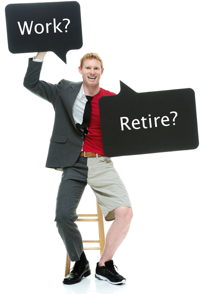 Many recent surveys show that 60 – 90 percent of retirees will work after their retirement. Why are People Working in Retirement? Necessity: There are numerous advantages of continuing to work – the main one being that you can continue to build retirement assets while delaying your need to utilize those assets. Rising healthcare costs, lack of adequate retirement assets, reduction of pension and retiree health benefits, increasing longevity and rising living expenses mean that many people need to work in retirement. Desire: Many retirees want to work in retirement. This group feels like they wish to contribute to and engage with society through work. No matter your reason, working in retirement can be an enriching experience. Continue reading to learn more about why and where to work in retirement and what you need to know to optimize your experience.